Wellnet Detects Undetected Claims Costs « They Said What? $463,000 reduction ($180 per person) in medical spending, on a base of about $6 million. $21 million reduction in “undetected claims costs” on 55 high-risk members ($4 million) and 453 medium-risk members ($17 million). What are “undetected claims costs”? We can’t find an insurance company that has heard of them, and we can’t find any definition on Google, or even any reference to them at all, other than Wellnet’s. 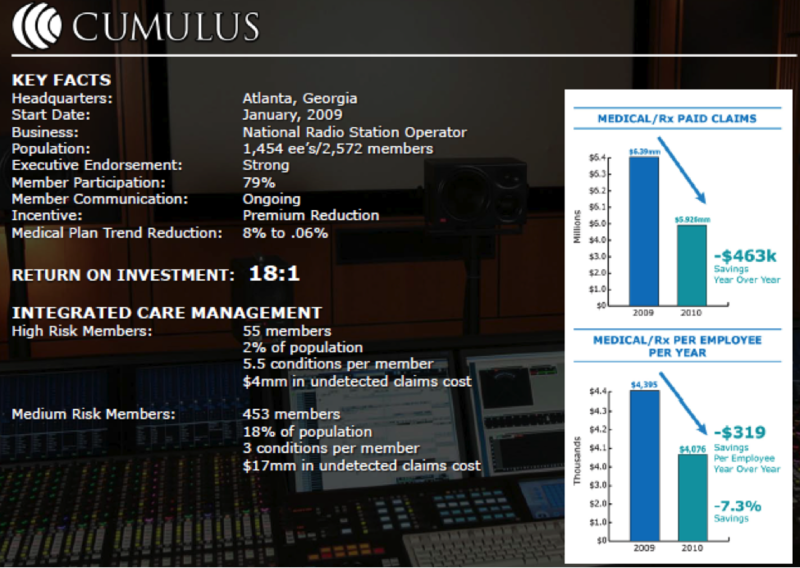 It’s not clear whether the 18-to-1 ROI is driven by the $180/person reduction in medical spending or the $21 million reduction in “undetected claims cost.” If the former, does that mean your wellness program only cost $10 per person? If the latter, how does the $21 million in “undetected claims costs” relate to the $6 million in detected claims costs? 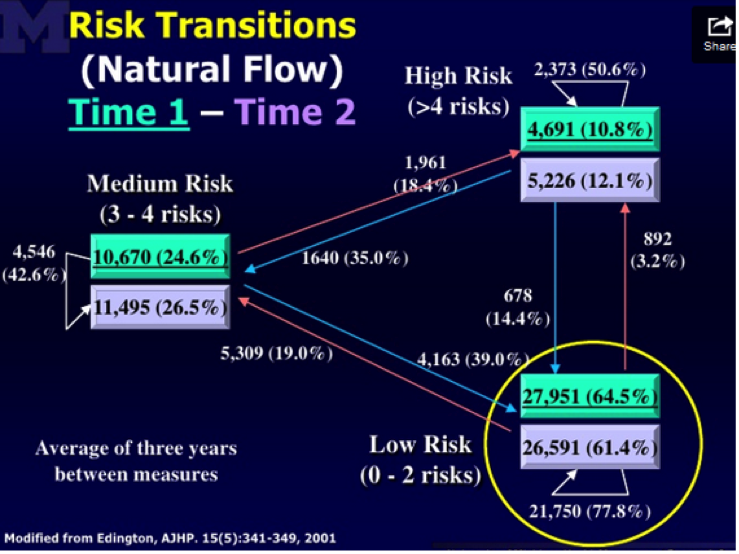 You list 508 medium-risk and high-risk members whose risk reduction accounted for the $21 million in “undetected claims costs.” Is it possible that many of the unmentioned 2000 employees and dependents who are low-risk might increase risk factors and therefore offset those savings, as Dee Edington’s model below would predict? By changing the axes on the graphs so that the cost bars are not drawn to scale, wouldn’t the physical difference in the height of the bars (about 50%) appear to dramatically overstate the savings (about 7.3%)? Doesn’t omitting the “$5.0” hashmark on the top graph exacerbate this effect even more? How does the 7.3% negative spending trend on the lower graph tie to the 0.06% positive spending trend claimed in the first section? On just the 55 high-risk members alone, you are saving $73,000 apiece, about 4 hospitalizations each. Can you share how this might be possible to do, through your wellness tools?